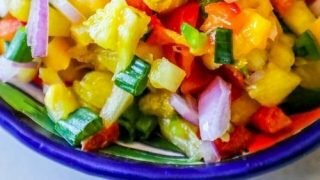 Spicy Pineapple Mango Salsa is bursting with spicy sweet flavor – a fresh, delicious salsa that is a huge summer hit! Great on tacos, salads, seafood, or as a dip! I recently wanted a bunch more for a few delicious recipes I’ve been testing, and didn’t have time to head down to Whole Foods to grab some – and decided to make my own. Whoa baby – this salsa is just as delicious and maybe even more flavorful than Whole Foods’ version… and so so easy to make! This salsa is perfect on a hot day when you want just a little bit of a spicy kick, but could use fresh fruit to cool you down. Its perfect in tacos, over hamburgers, over fajitas, or just as a dip! –Dice it! Make sure to dice your pineapple and mangos finely – small bits are the easiest to scoop, and will help the fruit release more flavor into the salsa. -Let it come together. While this salsa is fresh and delicious, it does benefit from a couple hours of “marinating” time to help the flavors really come together. Store in an airtight container in the fridge until ready to serve. -Salt makes sweet. 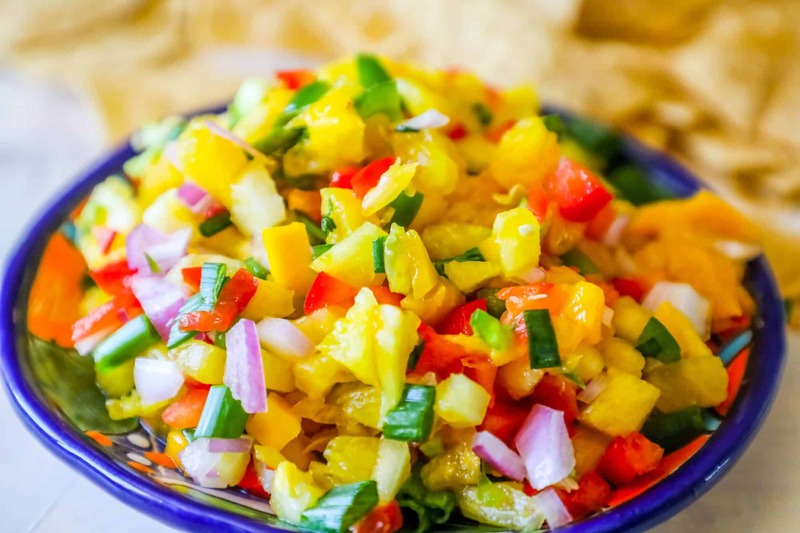 A dash of salt can really pull out the sweetness from the pineapple and mangos in this delicious fresh fruit salsa – so don’t fear adding a touch as you toss the salsa! This easy fresh fruit salsa comes together in no time – with no special equipment – but I have found a couple of kitchen tools that make this salsa even easier! Please click through my affiliate links below to see some of my favorite essentials! If you love this delicious spicy fresh fruit salsa, please check out some of my other homemade Mexican food favorites! These easy Mexican inspired dishes are family favorites, and always a huge hit at our house! Please click the links below to see some of my other easy fresh Mexican food inspired favorites! 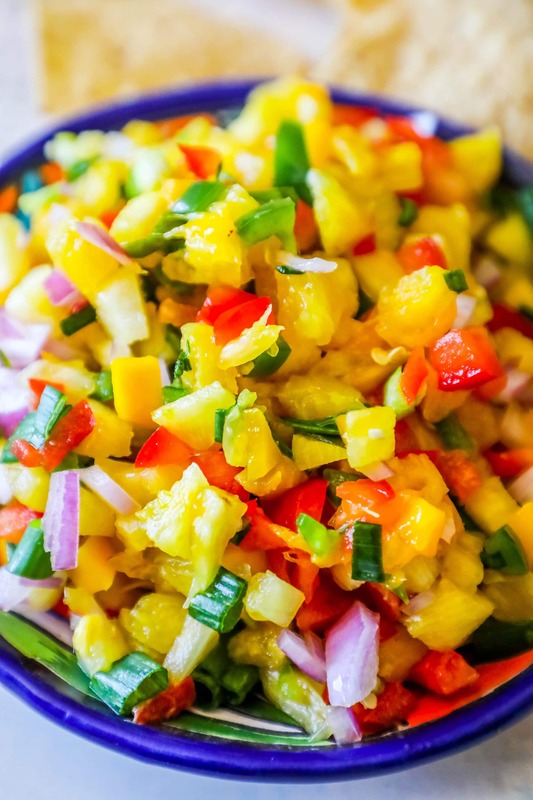 I hope you love this fresh and delicious pineapple mango salsa as much as I do! If you do, please be sure to share on Facebook or Pinterest – there is an easy to share facebook post just after the recipe! 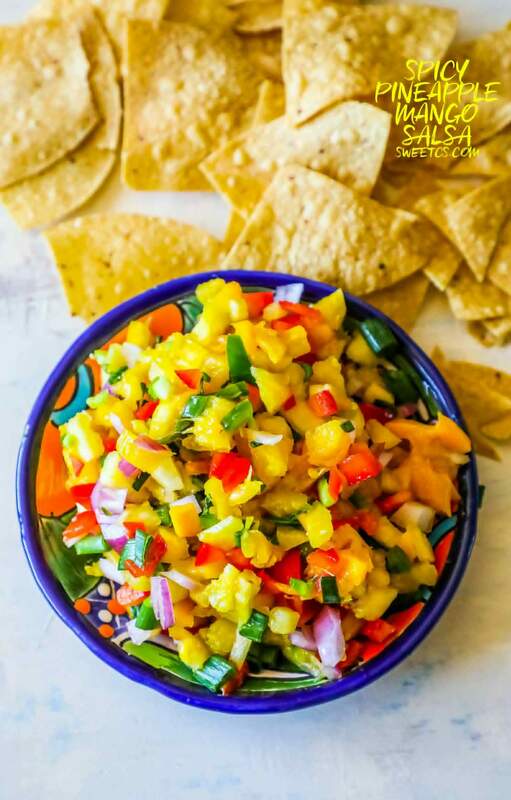 If you love this easy mango salsa recipe as much as I do, please write a five star review, and be sure to help me share on facebook and pinterest! Serve over tacos, burritos, salads, chicken, fish.... whatever you desire! Refrigerate to keep fresh up to three days. Very tasty, I added some fresh mint for extra zing.